While visiting Bethlehem is mostly about seeing the birthplace of Jesus, it’s been in the news recently for a much more modern reason: the opening of the Walled Off Hotel. On a recent day trip to Bethlehem with a group of fellow bloggers, this hotel, designed by the mysterious graffiti artist, Banksy, was our first stop. 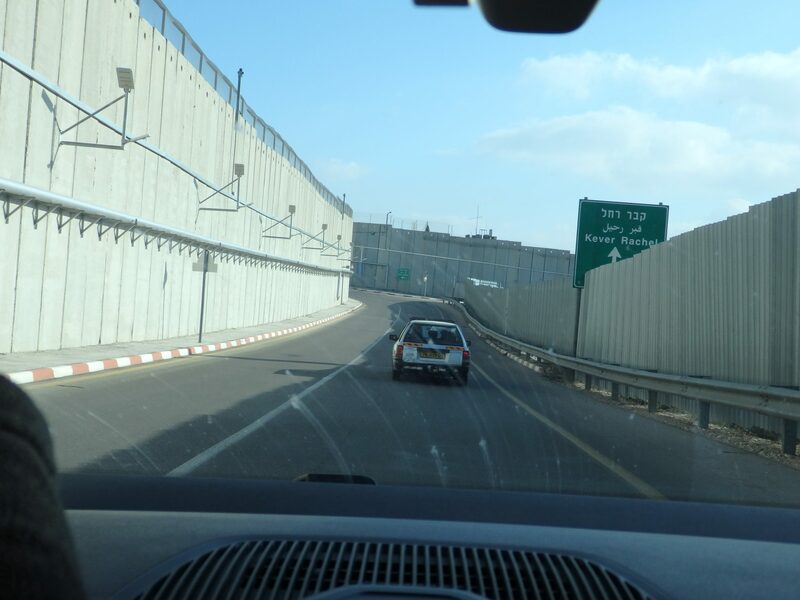 But first we had to cross the “border” between Israel proper and the West Bank. At first sight, the wall is astonishing. We expected it, yet, for those of us who had never been there before (I had), its sheer size was startling. A section of the border wall, with the Banksy Hotel just out of the frame on the left. You can see a guard tower on the wall in the background. I guess we looked a lot like tourists, because crossing into the West Bank was much easier than we expected. The gate stood open and the guards waved us through. No one checked our passports, but we presumed that they would check on our return, since the whole purpose of the wall is to prevent terrorist attacks on Israel. Parking right next to the wall, we got a good look at it, as well as the wealth of graffiti it carries. The Walled Off Hotel, also known as the Banksy Hotel, is right at a corner of the wall, near where a guard tower looms. The hotel stands close to the wall, with only a narrow street between. The lobby is worth visiting in itself. At first glance, it seems a fairly typical, somewhat opulent space. Looking closer, we found fascinating artworks everywhere we turned, most of which referred not very subtly to the Israeli-Palestinian conflict. The lobby and piano bar of the Walled Off Hotel. You can see the player piano on a raised platform in back, with cherubs in oxygen masks above it. Notice the mounted security cameras, and also the bookcase to the left, which is really a door. A player piano, its brand name spray-painted away, plays continuously. Instead of hunting trophies, security cameras adorn the walls. A stuffed cat tries to reach a stuffed bird in a cage. Life jackets litter a rocky shore in ornately framed paintings. In a series of three, a young man with a kerchief over his face hurls a grenade … or is that a flower? 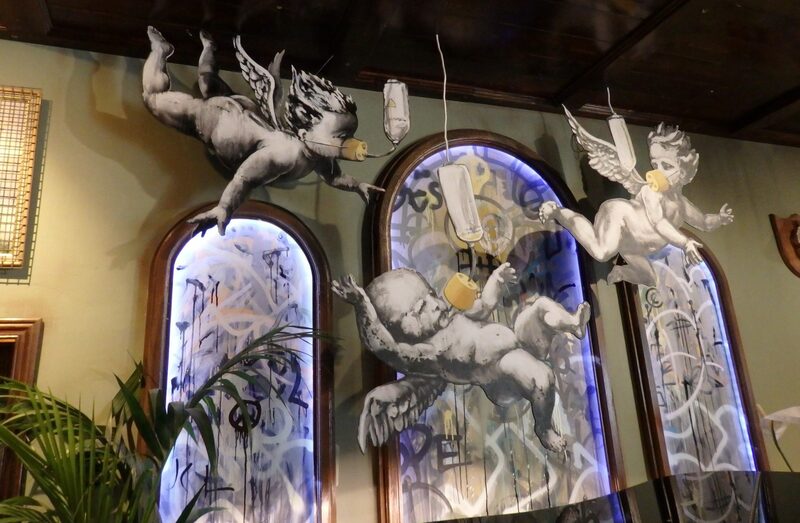 Cherubs wear oxygen masks as they cavort mid-air. And so on. artwork in the Walled Off Hotel, presumably by Banksy. We were not allowed to see any rooms, since they were occupied or being prepared. I can tell you, though, that they’re not cheap. Thirty US dollars will get you a bed in a dorm, with a communal bathroom and complementary earplugs. The next cheapest room costs US$215 a night, and the prices rise from there. Quite pricey for “the worst view in the world.” To book a room, by the way, the hotel will charge a refundable deposit of US$1000 to make sure you don’t steal any artworks. The hotel also houses a small museum focusing on the border wall’s history. (Disclosure: as bloggers we got to see the museum for free.) While it was interesting and well-presented, it also, not surprisingly, came off as biased. The Israeli side of the story is included, but emphasis is on the Palestinian side. The art gallery upstairs, on the other hand, impressed me. 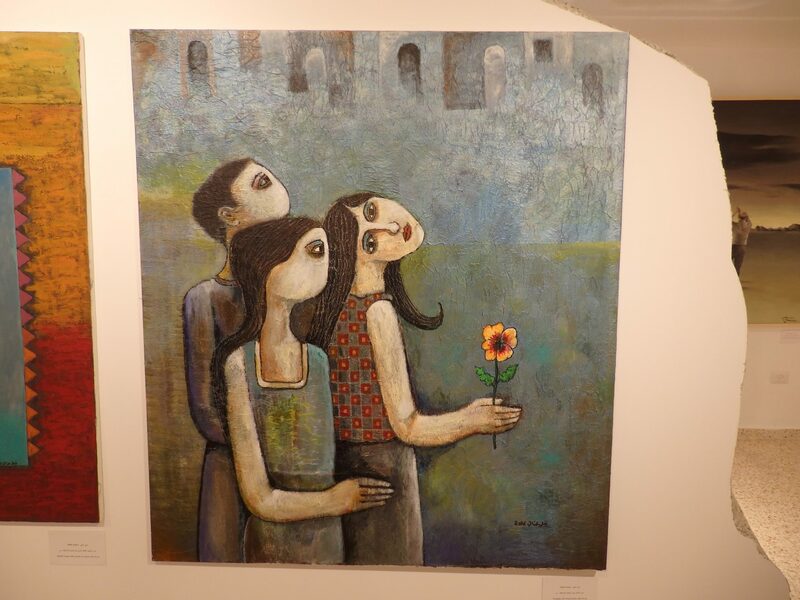 The collection features prominent Palestinian artists, and the quality of the works I saw was world class. The tour began at the Visit Palestine Center in the bustling central shopping district of Bethlehem. VisitPalestine is an online destination guide, but also offers all sorts of tours and services to visitors to Palestine. At their headquarters in Bethlehem, you can pick up tourist information, have a meal at their café, and shop for locally-produced souvenirs. 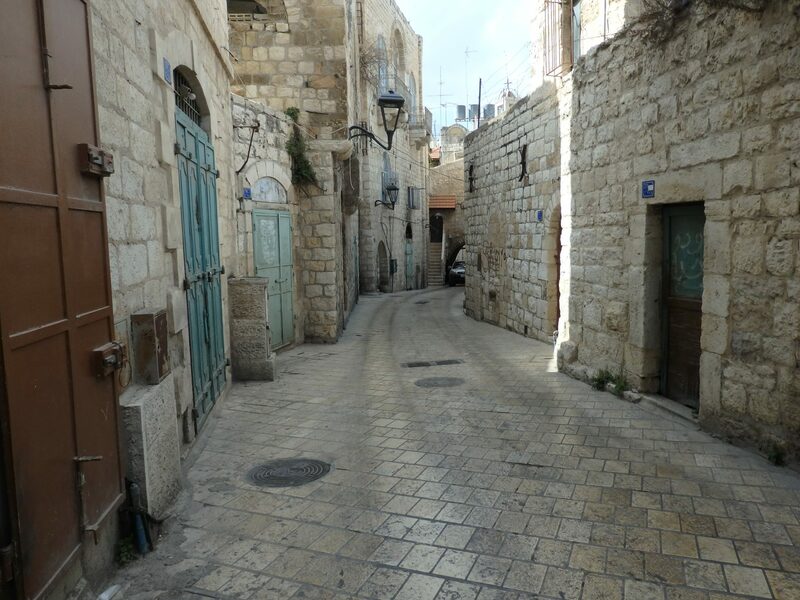 We took the “With Open Eyes: Bethlehem Old Quarters Walking Tour.” In our abbreviated version, we strolled through and heard the history of the seven different quarters of the old city of Bethlehem. Each quarter was founded by a different clan or tribe, and all but one of the clans were Christian Arabs. The earliest, called Al-Najajreh, dates back to the third century when a group of early Christians from southern Arabia settled here. Although we had to shorten it, so we didn’t get the whole tour, it was pleasant to wander the picturesque streets, away from the general noise and activity of Manger Square, hearing about something other than the Israeli-Palestinian conflict. Our tour guide was knowledgeable, and told the history in an entertaining way, in clear English. At one point, one of my fellow bloggers had a coughing fit. Soon a man from a nearby tea room appeared, offering her a small glass of mint tea, which he carried on a hanging tray. He accepted no payment; he just responded to the sound of her cough. “Tourists are welcome here” was the clear message. The tour did not include the Church of the Nativity, but it would be easy enough to add that stop before or after the tour. We went inside the church, which dates to the 6th century, with later additions. We didn’t have time to enter the cave that is purported to be the location of the manger where Jesus was born. The line was too long. The church is a UNESCO World Heritage Site. It also holds a place on UNESCO’s “List of World Heritage in Danger” because of the water and structural damage that threaten it. The Palestinian Authority is funding renovations inside the church that will, hopefully, save it from disaster. On our visit, we could only see a few small sections of the rich mosaics on the walls because of the scaffolding covering them. I presume that whenever they complete the renovations, it will be a magnificent sight. Leaving the West Bank through the same gate, we were again surprised. When a soldier stopped our car as we passed through the gate, one of my fellow bloggers said “We’re all Americans,” (not actually true) and the man waved us through. I presume they pay a lot more attention when Palestinians want to enter Israel. Our last stop was Rachel’s Tomb, and its location is an illustration of the tensions that continue between the Palestinians and Israelis. The site of the tomb is about two kilometers from Manger Square in Bethlehem and less than that to the edge of Jerusalem. Considered holy by Muslims, Christians, and Jews, it used to be shared by all three religions. Between 1948 and 1967, when Jordan ruled this territory, Jews were not permitted to visit it. In the 1967 war, Israel conquered the West Bank, including Rachel’s Tomb. Then, when Israel built the barrier wall, Rachel’s Tomb presented a problem because of its proximity to Bethlehem, which is in Palestinian territory. Today, the drive to the tomb is lined on both sides by walls. The road accessing it is essentially carved out of Palestinian territory so that Jews from Israel can visit. The building itself was wholly unremarkable. 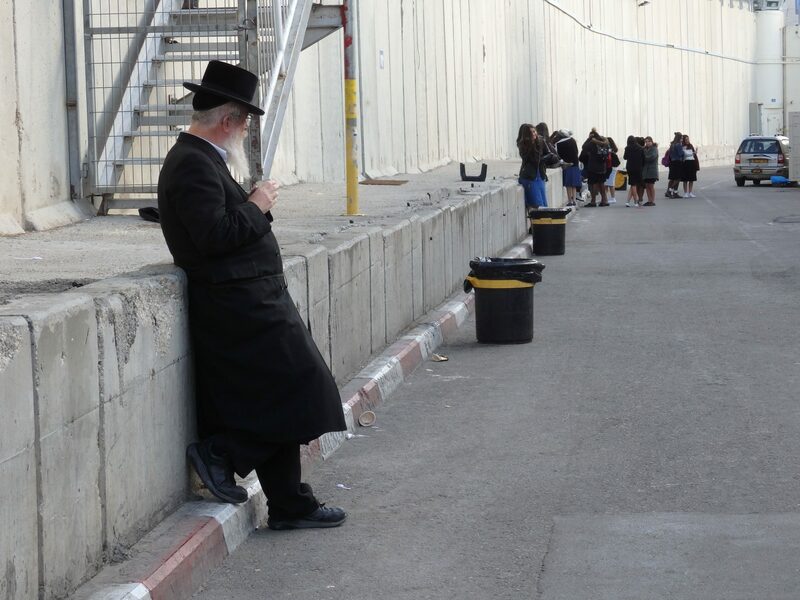 Inside, Jews prayed in two rooms: on one side, women; on the other, men. Of course, I only saw the women’s side. It felt chaotic because of the heat and the noise of women praying loudly, not in unison, but each at her own pace. This was not ritual prayer, repeating words out of duty. Women prayed with feeling. On one side of the room, a woman sobbed loudly. I can only guess, but given that women visit Rachel’s Tomb to pray for fertility, she might have been mourning her own or someone else’s infertility. 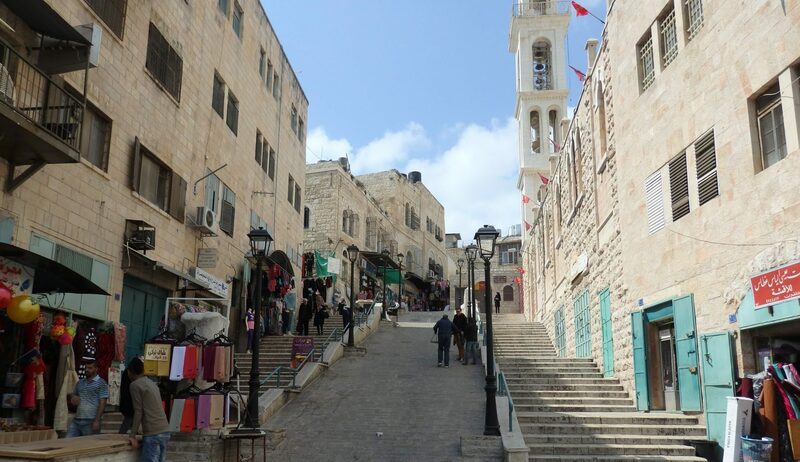 For Christian pilgrims, Bethlehem is an obvious destination. I would recommend visiting Bethlehem to everyone, though, for two reasons. First of all, Bethlehem has a fascinating history, much of which is embodied in the Church of the Nativity at its center. Make sure, also, to explore the old city. Do it with a tour as we did, or on your own with a guidebook. Secondly, if you have any sympathy for Palestinians in the current stalemate of the “peace process,” then visiting Bethlehem – or anywhere in the West Bank – is a way of supporting them. When I was at World Travel Market last year, the Palestinian Authority had a booth promoting tourism to the West Bank. The booth sat apart from the rest of the Middle East booths, and I saw very few people approach it. Yet there is much to see: visit the ancient city of Jericho, for example, or go hiking in the Judean desert. I understand that many travelers worry about safety. Certainly you should keep track of current travel warnings as you plan, and make sure to have travel insurance in case you have to cancel last minute. However, the Palestinians want tourists. They want to earn tourist dollars, and they will do their best to welcome you. 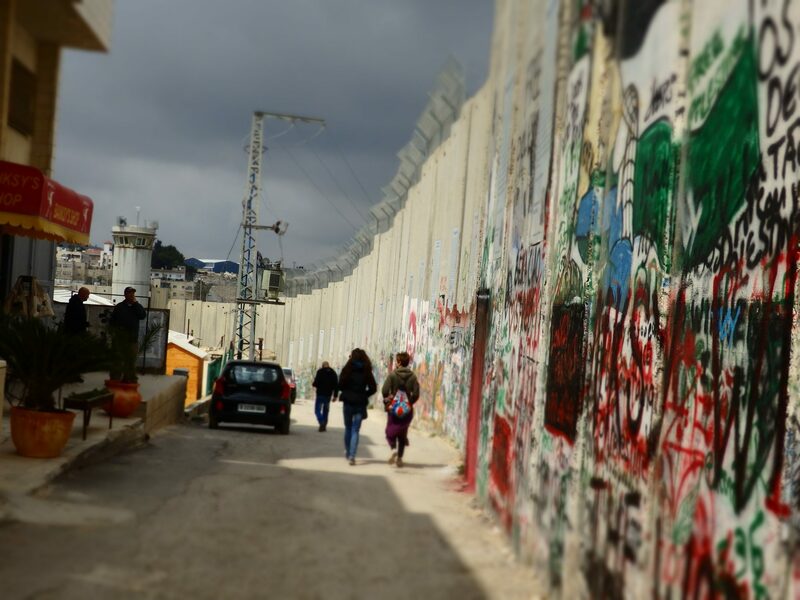 Have you ever traveled in the West Bank? What was your experience? Add a comment below! Great tour you provided of Bethlehem. We were there a couple years ago and got just a taste of the place as you said ‘the wall’ is breathtaking. I just finished reading ‘The Lemon Tree’ by Sandy Tolan, a true story written in novel style (easy read) of the history and conflict in the area. Put a whole new perspective on the headlines for me, I think you’d enjoy it. 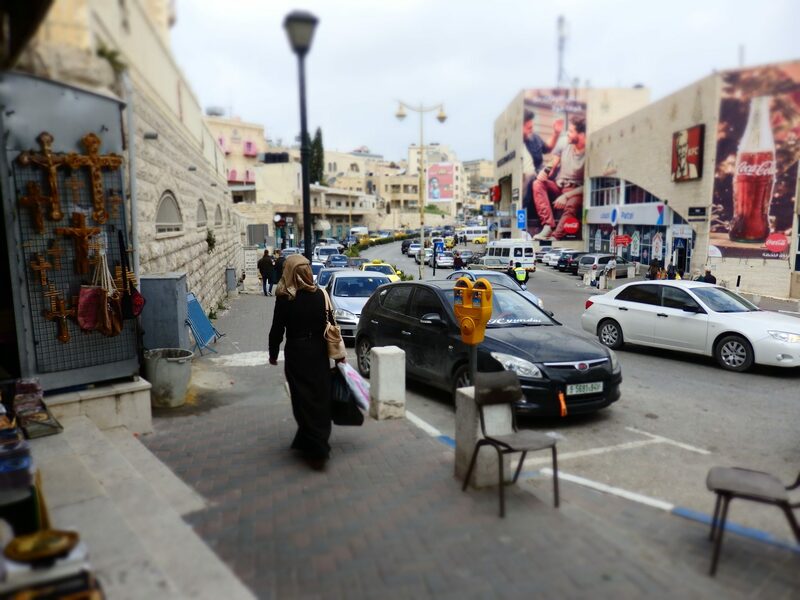 I was in Bethlehem in 1976 – what a difference now! You could just drive to it then – no border walls – but on the other hand there was nothing to see then apart from the church and the tomb. That hotel looks amazing – I was very disappointed not to get to Bethlehem this time around. I was last there in 1985, which was also before the wall. And we also only saw the church and tomb. The old part of Bethlehem was there; it just never occurred to visitors to go see it! 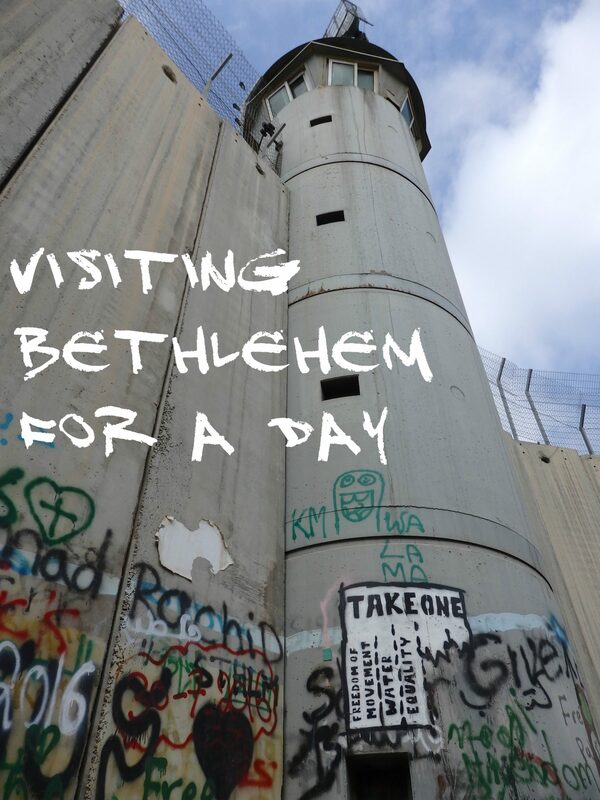 I really like this post about your walking tour around Bethlehem. I’ve never been to the West Bank or Jerusalem for that matter, but I certainly want to. I love the inside of the hotel, and of course, living in Berlin, Banksy artwork is everywhere! I really wish I had been able to go to the TBEX conference in Israel last year, but for personal reasons, I prefer to choose 1 a year. And Asia won! Definitely go to Israel; it’s endlessly fascinating! So interesting. 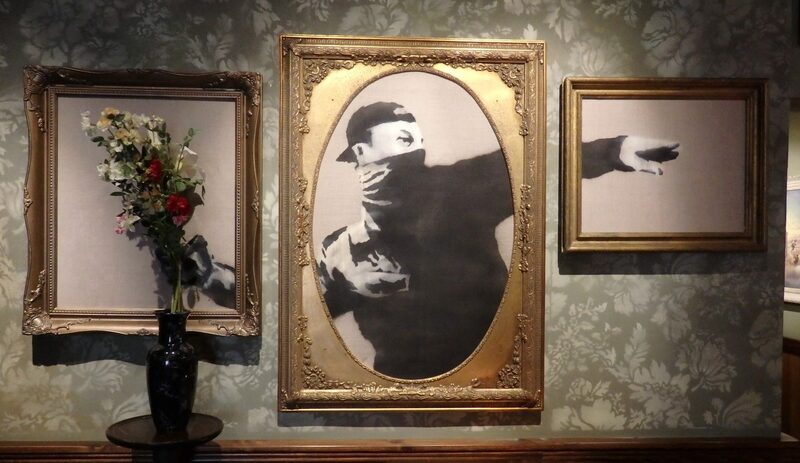 I love Banksy art and would love to see the hotel. You certainly made the best of your time in Bethlehem. The shortened tour gave you lots of time to see many areas of the city. And I appreciated the photo of the wall; I had no idea it is so massive. Thank you for a great article! What a fascinating story Rachel. I haven’t been to Bethlehem but you really illuminated a different side for me. 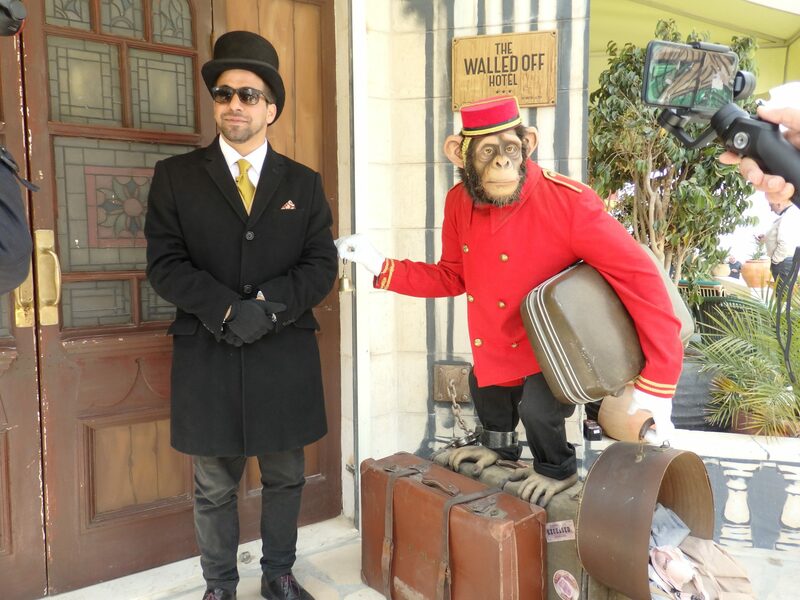 I’d love to visit that Banksy hotel and check out all the art. Definitely putting this on my must-visit list. If you can swing it, stay there too. 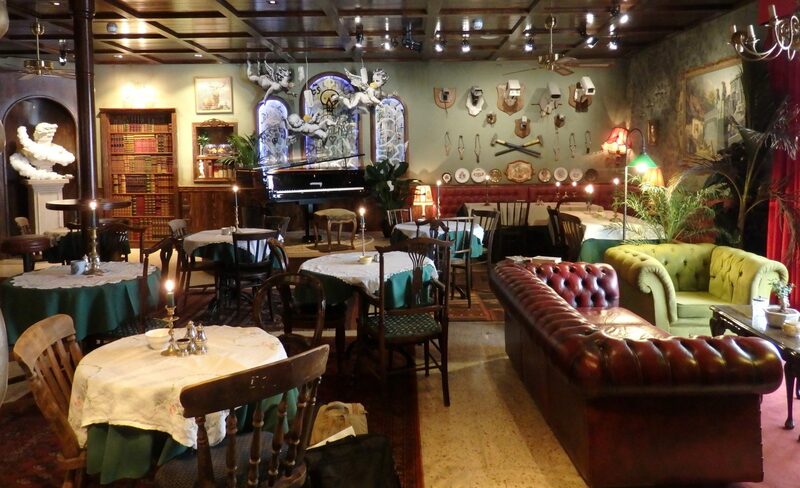 The rooms look pretty special, judging from the pictures on their website! I was in Israel 20 years ago and did visit Bethlehem but it was different. I only spent one day there, and did not see the wall, but it looks fascinating. Hi Rachel, I’ve not been to this area and I’m not sure that I will ever get there. It would be extremely interesting from what I’ve seen from your post. Quite an exciting place to visit I think. If you get a chance, you should go. It’s a fascinating place! Rachel, I like your writing style and the details you describe. I feel like I’m right there with you. Nice post. I’m not religious either, but religious sites are so important that you can’t get an understanding of a culture without seeing its religious practices. That hotel looks rad! Noted for if/when I make it to Israel! Go for it! The rooms are supposed to be pretty special! That’s quite a huge jump from $30 to $200+ and I’ve never heard of a deposit of $1,000!!!! I know you quickly touched the topic of safety at the end of your post but did you personally feel safe while you were there? The deposit isn’t a surprise when you think about the value of Banksy’s art. I didn’t feel like I was in any danger either in Bethlehem or anywhere in Israel. Oh well! Next time you should definitely plan to travel in Israel. It’s a fascinating place! Really? Certainly Israelis and Palestinians both can come over as abrupt to Americans and the British who tend to value politeness very highly, but I found both Israelis and Palestinians to be friendly and happy to see visitors.